I have become a big fan of Ta-Nehisi Coates’s column over at Atlantic Monthly, especially his thoughts about what the Civil War means to a young African American male. [See here, here, and here] I’ve met Frank Smith a couple of times over the past few years, most recently in 2007, when I interviewed him as part of my research on black memory of the Crater. Mr. Smith has been involved in D.C. politics over the past few decades, but he is perhaps best known for helping to bring about a monument to United States Colored Troops in the city. He also established a museum a few blocks from the monument, which explores the history and contributions of black soldiers to the Civil War. I just love the way they shrug off talk about black Confederates. We could take issue with Smith’s claim that no free black Southerners managed to join the army, but there is something refreshing about watching these two men discuss a subject that they understand. I think the explanation for the “black confederates” position is that the preface to it is his statement that all the names on the memorial come from official military records. You are absolutely right. It's curious that those who push the black Confederate agenda fail to appreciate the need for military records to confirm the enlistment of any individual soldier. Instead we hear about pensions awarded decades after the war or my favorite, which is that the “Yankees” intentionally burned those records. Frank Smith has done an excellent job so far with a very limited budget. Come on Kevin Lots of records got destroyed. My own Civil war relative had to get 3 men he served with in Company D Cross Achors to sign an affidavit and it was notarized by the Spartenburg County Clerk so he could get a Confederate Pension because the State of SC could not find his records and stated they had been destroyed by Union troops during reconstruction. I'm not suggesting that records were not destroyed, just that the records hiding the service of thousands (even hundreds) was not. And the reason is because, as far as we know, there were no records to destroy. 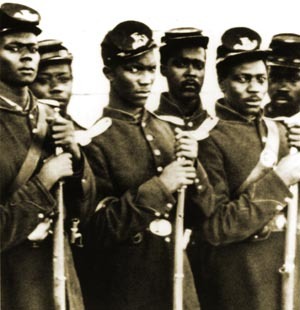 Knowing the resistance in the upper command of the South to black troops could they instead of Union troops destroyed any records of Black troops? The evidence suggests that there was resistance at all levels of command and on the home front as well. The debate itself is given extensive coverage in Bruce Levine's book, Confederate Emancipation. I recommend that you read it. There is no evidence that any records were destroyed so it is of very little value as an avenue of research. We could arrive at any conclusion if our argument was simply that the evidence was destroyed that would support it. Not a very fruitful approach. This is a variation on my favorite argument among proponents of “black Confederates” for the lack of supporting records – that they were destroyed by Confederates themselves to protect all of those loyal slaves, errr, black Confederate soldiers from retribution at the hands of those evil Yankees after the war. And the cW and its aftermath was an era for which documentation was critical. It's the reason that one of the richest treasure troves of detailed information about individual soldiers is the postwar pension applications files, particularly the disability ones. Right, I was just making the point that the decision to give a black man a pension did not necessarily reflect service as a soldier. I understand. The awards of pensions to certain blacks by Southern states was, of course, outside of the federal pension system. Ironically, Congress ultimately authorized small pensions for Mexican War veterans and their dependents. It was a backdoor way of aiding impoverished widows of leading Confederates who had been in the US Army before secession. Well I don't have any agenda to promote, or books to write; I am just honestly searching for the Truth and trying to remain free of 2 emotional and dogmatic polar opposites I find here and on other sites. I wasn't suggesting that you had an agenda. It seems to me that most of the people who comment on this site about the issue are not dogmatic; rather, they are rightly skeptical given the lack of evidence. I have done my best to try to understand the issue in all of its complexity. No Problem Kevin IMO Kevin I find most here too skeptical while the SCV/UDC folks are overly ready to accept things that the evidence doesn't support. Still I have found out much about what other people think in other parts of the country. Have fun teaching and enjoy the rest of your day.